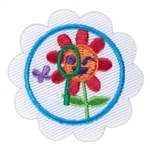 Girl Scout Journey Award Patch Set is an iron-on patch with three iron-on embroidered appliques: watering can, bee, and flower. 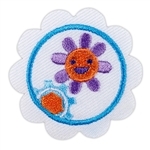 This is an Earned Award; criteria can be found in item 67100, Welcome to the Daisy Flower Garden. It's your planet! Love It! Girl Scout Daisy Award . Iron-on Patch. 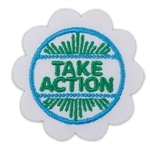 Girl Scout badges, patches, awards, and other insignia that are earned for the accomplishment of skill building activities or any set requirements should be presented, worn, or displayed only after Girl Scouts have completed the requirements outlined in the appropriate program materials. 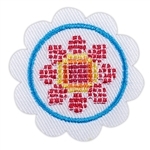 Iron-on patch with three embroidered appliques: a bird, birdfeeder and flower. Imported.